2016 Mid-Year Checkup: Are You Avoiding These Mistakes? It’s the middle of the year! In the midst of all of the sunny-day fun that you’re probably enjoying in your personal life, you might also (if you’re smart) take a moment (or a day) to consider how things are going with your freelance service business, or your agency. As you examine your progress, there will be plenty of things for you to take pride in. But inevitably, you’ll also find that you’ve made mistakes along the way. Some mistakes will present themselves as fresh learning lessons, while others will serve as refresher courses on challenges you still need to overcome. I’m listing an adaptation a few of the most common mistakes that small business owners (and you too, lone freelancers) tend to make. See if you can recognize yourself in any of these examples. And if you do recognize yourself in any of these, then know that it’s never too late to pivot in a new direction! ‘Of course we’re chasing after money, Terr! Why else are we in business?’ you’re probably thinking, and of course, the goal of your business (and every business) is to generate enough revenue to become profitable. But what I’m talking about are the types of moves you make that blind you to aspects such poor-fitting projects, potentially bad clients, and offering services that you really don’t like, simply because you heard that if you keep doing these things, then money will begin to fly out of your computer screen every morning! But seriously, ask yourself if you’re making business moves solely based on the money involved, particularly if there are large sums of money involved. Ask yourself if it’s all worth the headaches and the heartbreaks associated with these. And ask yourself if your perception of how much money you’ll be able to generate is realistic with your current resources, skills, ambitions, and inclinations. There’s nothing wrong with being friendly to employees, prospective clients, and current clients. However, I’ve witnessed far too many service providers making business decisions based upon their personal need to be liked. I’ve seen freelancers and small business owners fail to ask for the rate their projects deserve. I’ve heard others saying that they felt the need to give their client a break because they client is nice. Well, it’s always nice to deal with nice people, but ask yourself if you’re pitching for new business, or are you pitching for the role of the service provider who can be taken advantage of, due to low self-worth? You don’t owe it to a potential client to give them a break, particularly if they communicate with you that you should give them a break (often in the guise of more work). When you go to the store, you pay for items, and you often don’t get to negotiate the price. So why is it okay for others to demand that you lower your prices, let alone, manipulate you into doing so? Here’s an issue that I personally had to grapple with. I realized that my lifestyle was extremely lopsided-I spent pretty much all of my waking hours online, at the expense of the aspects of my life that were crying out for my attention. And here’s the thing-it took for me to experience a personal low for me to realize that there’s a difference between taking care of my clients (and therefore, my bills) and taking care of myself. Therefore, I’ve scheduled time during my work day for desperately-needed exercise, journaling, entertainment, meditation, and industry (and personal) reading time. And I’ve taken steps to indulge in long set-aside hobbies on the weekends, too. You need to create time to check in with yourself as a human being. You also deserve to make time to decompress. Think of all of the energy you place into marketing yourself, sending out proposals, winning bids, finishing projects, managing finances (or employees), just to do it all over again. You take care of so many things over the days, months, and years. Who’s taking care of you? Your short answer might be, “This is how I pay the bills!” but this isn’t a clear answer or a rallying point to continue. When’s the last time that you sat down with yourself (see tip number three) and deeply thought about the reason why you’re working for yourself? There’s only so far you can go with chasing money. You’ll need a deeper reason to continue that motivates you when you’re feeling unsure of yourself, when you’re experiencing more accounts payable than you are accounts receivable, or when you start to experience shiny object syndrome. And it’s okay if you decide to shut down your business, but it’s best to have an exit strategy in place. Whatever you do, don’t move forward blindly. Understand all of your reasons why, then move forward accordingly. By the way-just how are you going about finding clients? And what steps are you taking to present yourself to them in a way where they take you seriously? Yes, there’s all sorts of things that you can do in order to gain attention, but then what? Did you know that after your call-to-action conversion, you’re not finished with the sale yet? You’ll now need to send your potential client a fleshed-out proposal. See, your marketing campaign attracts traffic, but after your prospect has been sifted out from the traffic, then what? You’ll need to present a tailor-made case as to why they should hire you. Therefore, the proposal process had better be included in your marketing plans. So far, I’ve mentioned mistakes that you might be making that directly affect you. 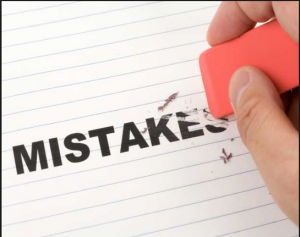 But what about those mistakes that affect aspects of your business, such as your brand or your reputation? It’s crucial that you understand how to handle mistakes, particularly if you’re new to offering your products or your services. For example, how will you handle complaints? What is your reaction when you’ve learned that you’ve received a bad revue? As fun as it is to imagine your success, you’ve got to be ready to get out in front of problems and issues, too. This is a hard aspect to consider if you’re a lone freelancer. After all, you’re responsible for everything, so how could you possibly delegate your business processes? The fact is, there are all sorts of processes that we can offload to some willing soul with the click of your mouse and your credit/debit card. Even if you’re a freelancer, you can find someone to help you with small, affordable tasks. For example, I have a friend who launched her own site design agency. She realized after a period of time that she’d never succeed if she attempted to perform all of her business operational processes alone-there was just no way that this would be sustainable! So then, she decided to use an extremely affordable model to help her to get things done. She hired a team of freelancers who white-labeled their work under her business brand. The freelancers didn’t get paid unless there was a client project in progress. The only person who was paid out of her pocket was her overseas virtual administrative assistant, and even then, the fees to hire the assist was dirt cheap. She saved money and her sanity by delegating projects to other people according to their skills and their strengths! I’m thinking of following her example by hiring an on-call admin. assistant. And I’ll also hire a part-time housekeeper so that I can save more of my energy for future business projects, and writing. Now that we’re inching into the latter part of the year, it’s probably a great idea to reward yourself for your victories, and ask yourself how you can correct any mistakes that you’d love to resolve before the end of the year.